One of the things I love the most about blogging, is how much it’s taught me. I never really got into makeup at high school. Instead I got into it when I read other blogs. I like to think that I’ve learnt quite a lot, so I thought why not share with not everybody else? I’ve also Learnt How to Declutter My Makeup Collection. I used simple makeup wipes for years, as I thought it was quick and easy, but I wasn’t aware at just how much they were drying out my skin. I have dry skin anyway and the wipes were not helping matters. I always assumed the more money something cost the better it is, but that is not always the case. You can’t go wrong with the Rimmel Stay Matte which is a bargain at £3.99. Makeup brushes also mean you don’t have to touch your face, so you won’t get any of the germs from your fingers on your face. Just because you won’t be getting the germs from your hands on your face, it doesn’t mean you’re out of the woods, as germs can build up in your brushes if they aren’t washed. Which you’ve guessed it, will transfer to your face. It’s extremely easy to get into bed with a full face of makeup and quickly fall asleep. Sleeping with your makeup on is a sure way to mess up your skin and wreck your eyelashes, so just be sure to remove it before getting into bed. I never used to use primers, but just recently I’m seeing how much they are helping. Primers really help your foundation to stay put, primers also allow your makeup to go on much easier. Washing your hair everyday is a huge no-no, so dry shampoo can really help for them in between days when your hair is starting to look a little greasy. Dry shampoo has come an extremely long way, as there are new formulas that are pretty much invisible. 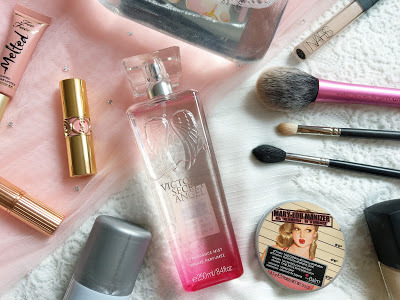 Those are some of the beauty lessons I learnt from beauty blogging! "Charlotte Tilbury Liv it Up Lipstick Review"
"How To Be More Productive"
Great post, since blogging I've ditched the wipes and stopped washing my hair everyday and it's worked wonders for me! I completely agree with so many of these! I absolutely love dry shampoo! Especially for those lazy days when you don't want to wash you hair. Also have to give a shoutout to primer! I love it so much, it stops my face from getting patchy. Great post, glad to hear you've learned this from blogging!